An aerial shot of the new Miami Trace High School. A dedication/open house is scheduled for this Sunday at the new school gymnasium. The Miami Trace Local School District encourages the community to come out to this Sunday’s unveiling of the new high school. An open house will be held in the school’s gymnasium in order to accommodate a large crowd. The dedication will begin at 2 p.m., and the community is also invited to join the staff from 3-5 p.m. for an open house and building tours. All guests should use the event entrance to enter the building, and it will be completely opened for everyone to fully explore. All guests will be parking in the lots marked “staff and student parking.” All Miami Trace staff and special guests will use the bus lot. If parking becomes full at the new high school, those attending are asked to park at the middle school. The first day in session for students at the new school is scheduled for Feb. 20. Student orientations and tours will precede this date. 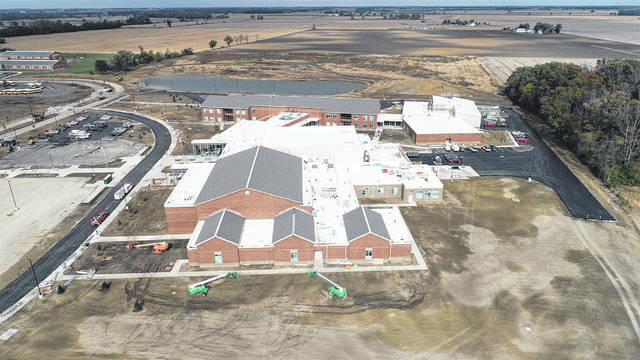 https://www.recordherald.com/wp-content/uploads/sites/27/2019/01/web1_201811211594068_image.jpgAn aerial shot of the new Miami Trace High School. A dedication/open house is scheduled for this Sunday at the new school gymnasium.